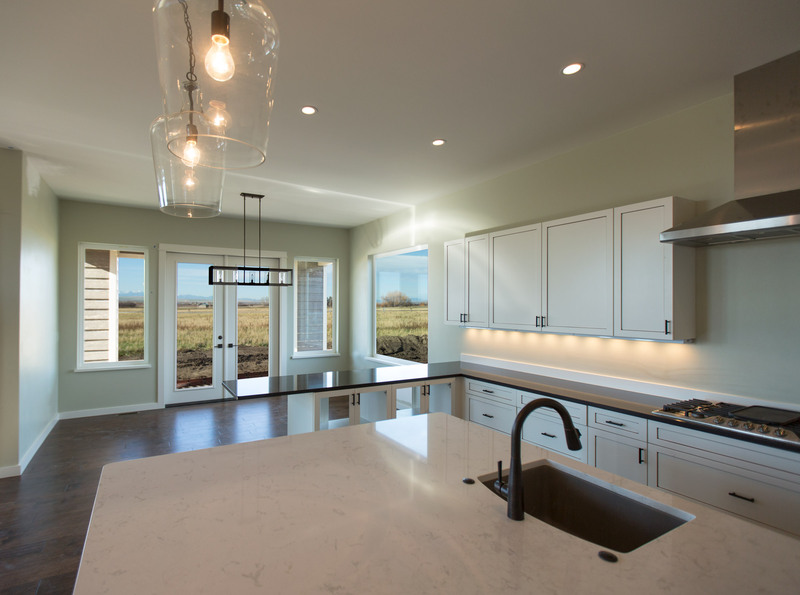 The Dry Creek Ranch is a custom home nestled within 20 acres of rolling wheat fields. On the outside, low pitch metal roofs, timber knee bracing and long facades combine to deliver on a Ranch-Style Theme. Weaved into the interior are both rustic and modern design elements. 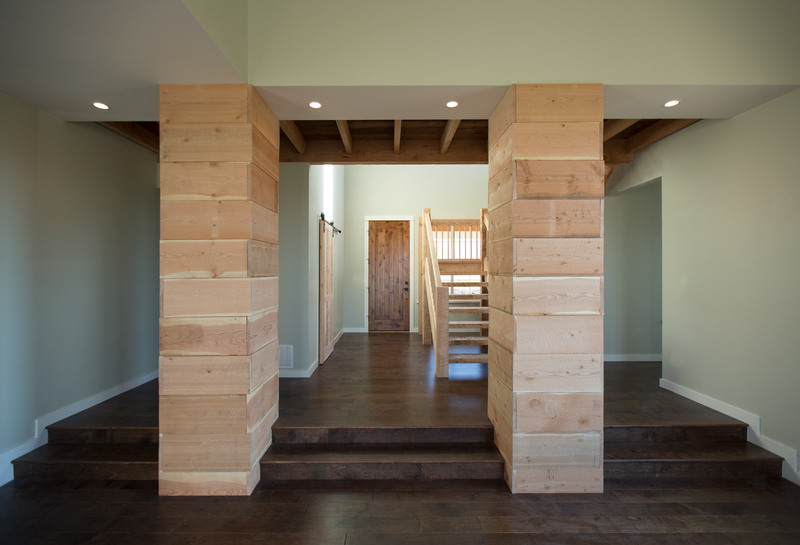 At the front entry a free-standing staircase is crafted with heavy rough-sawn timbers. The Master Suite is completely separate from other areas in the house and is organized uniquely to provide a private corner view from the tiled shower and tub. 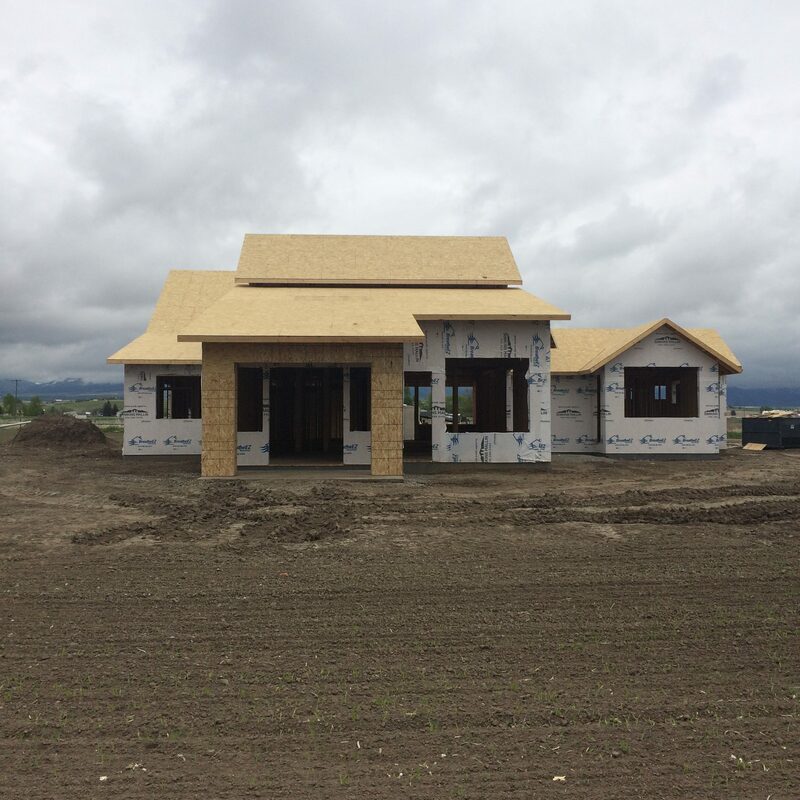 Please follow the Design & Build story of Dry Creek Ranch as we develop custom details like a bridge, outdoor covered dining area, 2’x2′ real-wood pillars, and more! This is the first look at color options. Stay tuned during construction to view the development. Staking out for footings in a freshly dug hole. 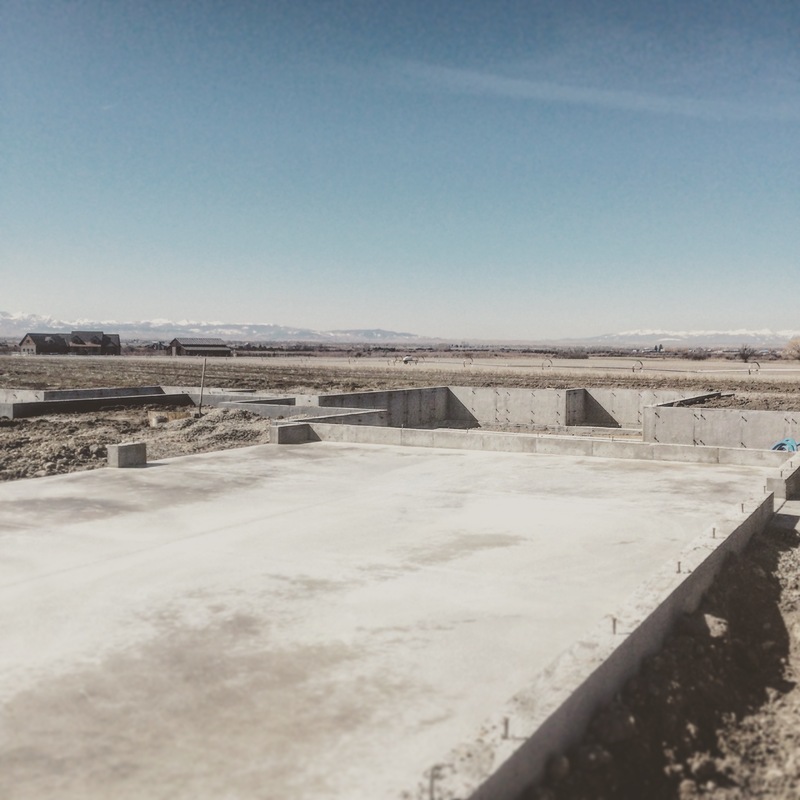 The foundation weatherproofing is complete. 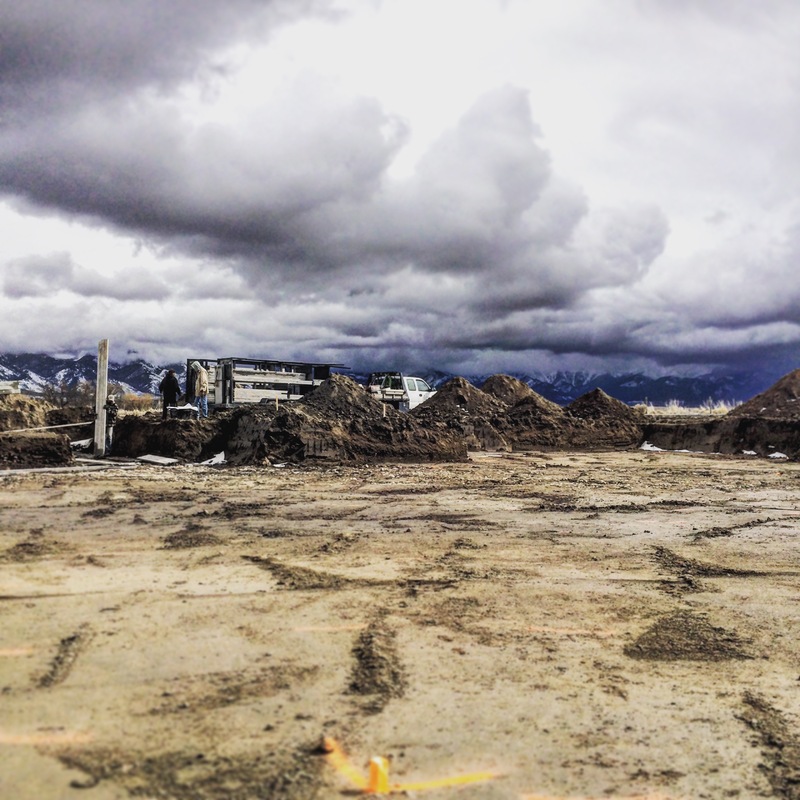 Excavators can establish final grade by back-filling these piles. 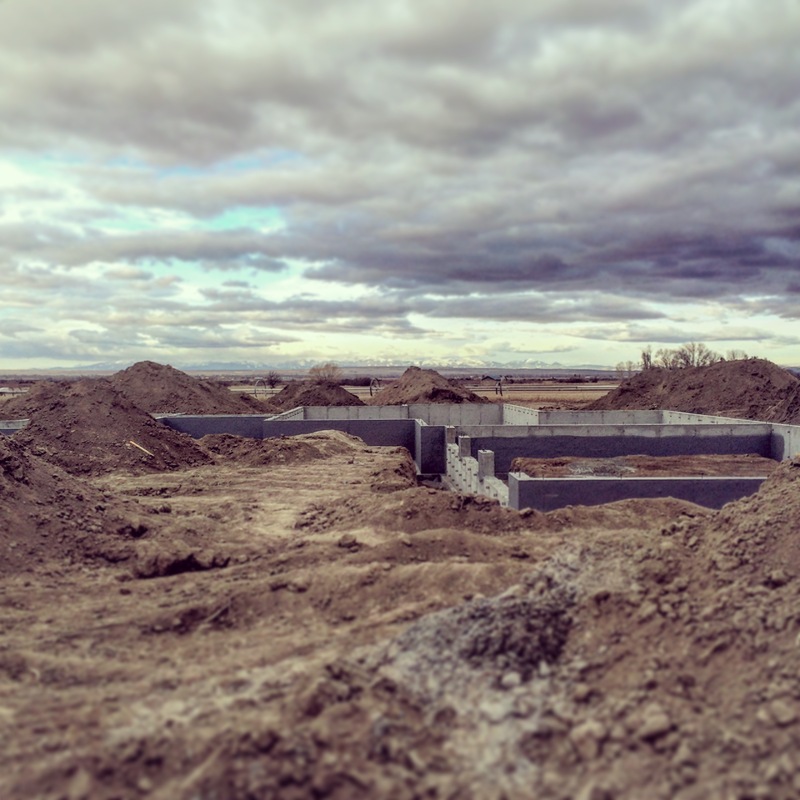 The three car garage was poured today. It slopes out each garage door for proper drainage. 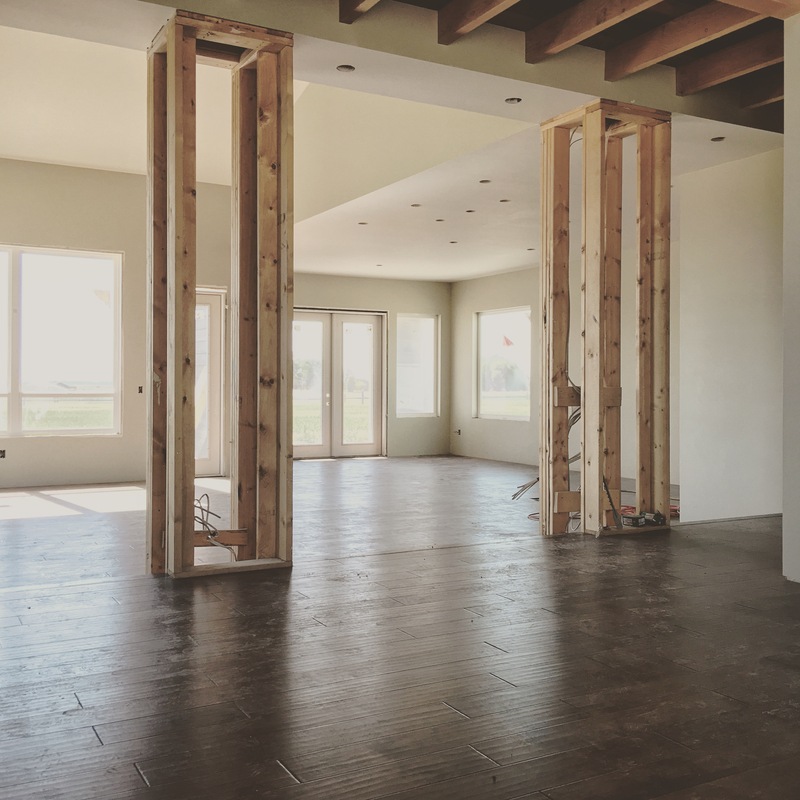 The Great Room, Kitchen and Dining Room ceiling height grows from 10-0" to 20-0". 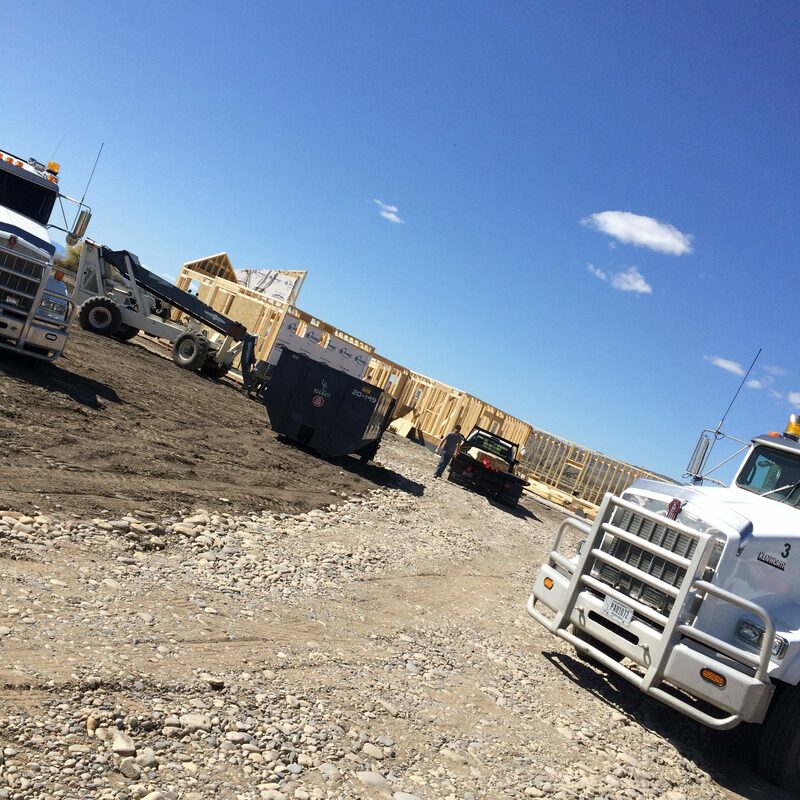 Two truck loads of trusses, framing materials and a fresh dumpster have been delivered today. 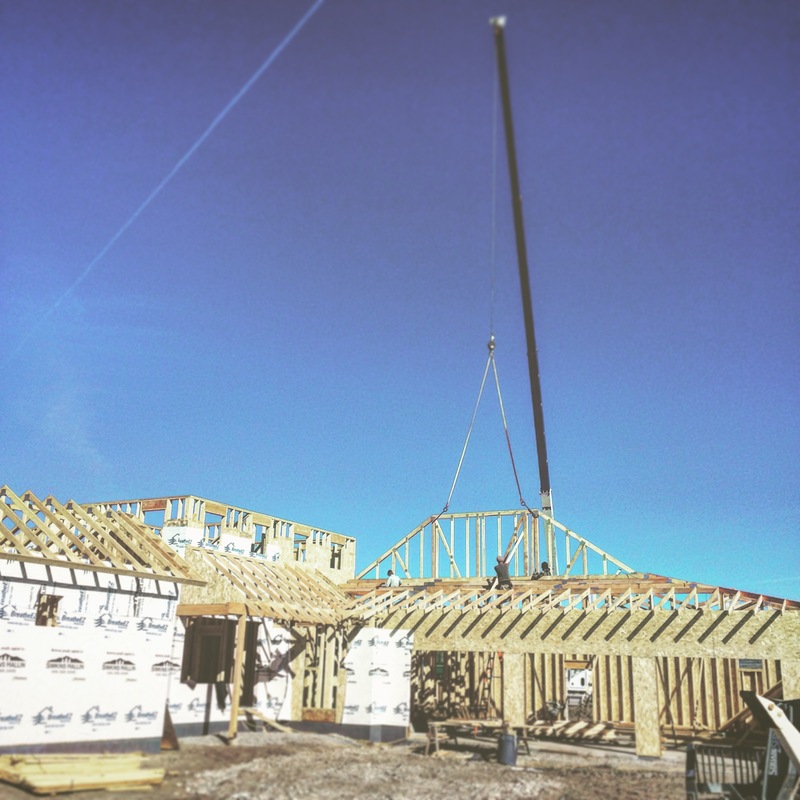 It's crane day at the Dry Creek Ranch! 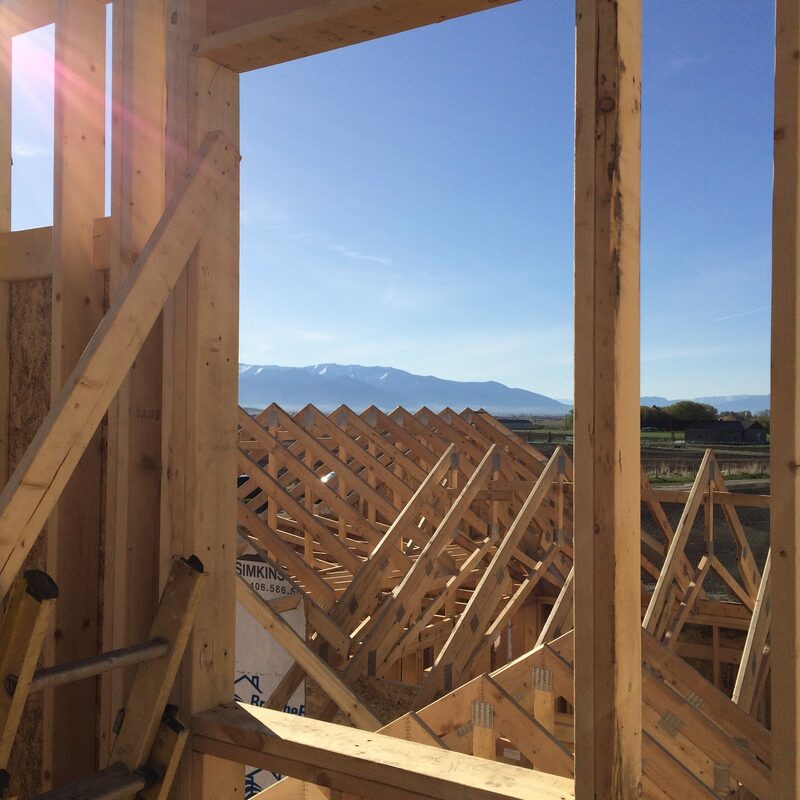 These roof trusses are 72'-0" long. 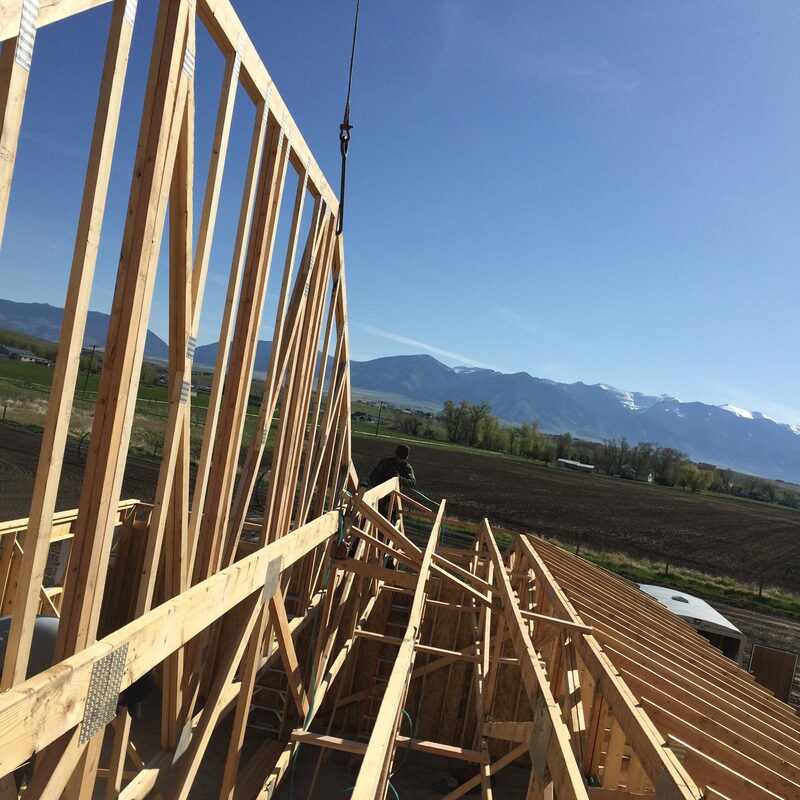 This truss was designed to transition into a shed roof. 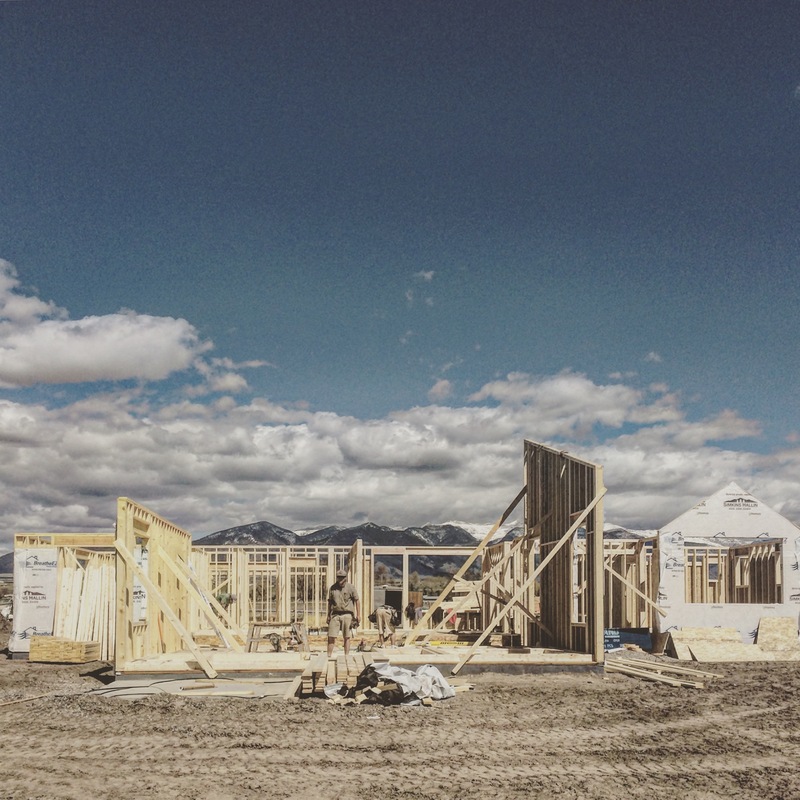 It is a single truss that will be piggy-backed with a smaller truss to extend its height. 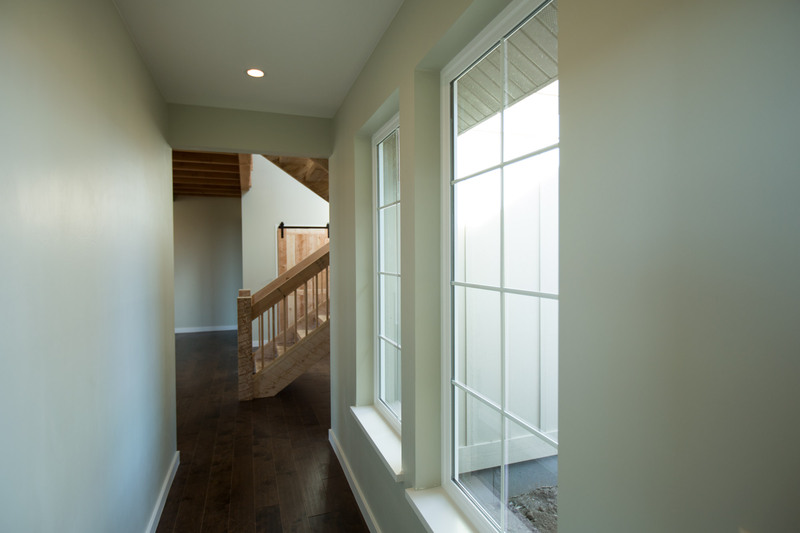 This 3' x 4' window is operable and looks out over the Master Wing from the second level bridge. The roof is complete. 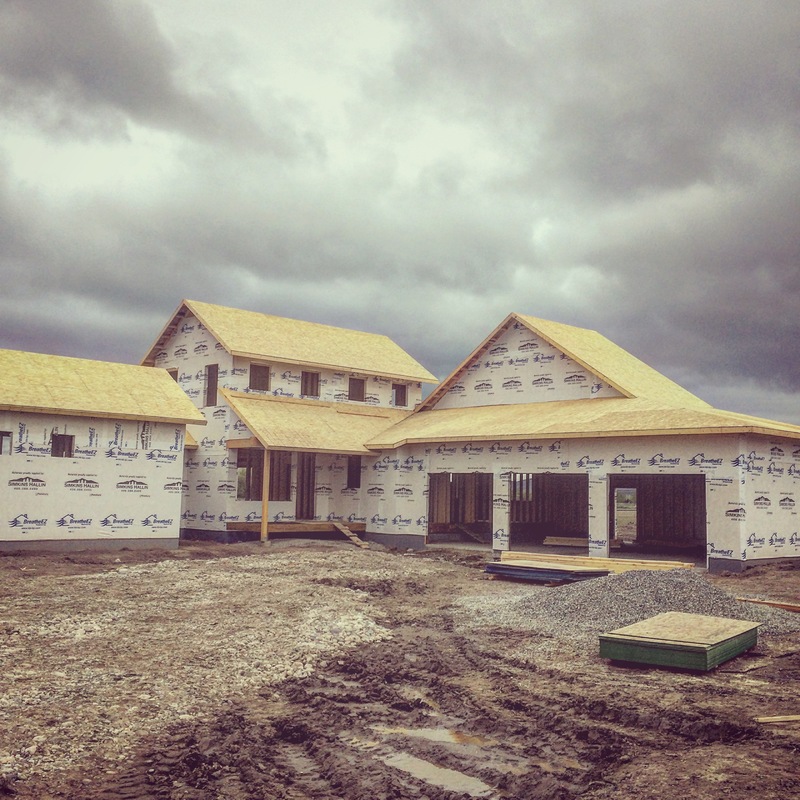 Windows will be delivered and set in their rough openings. 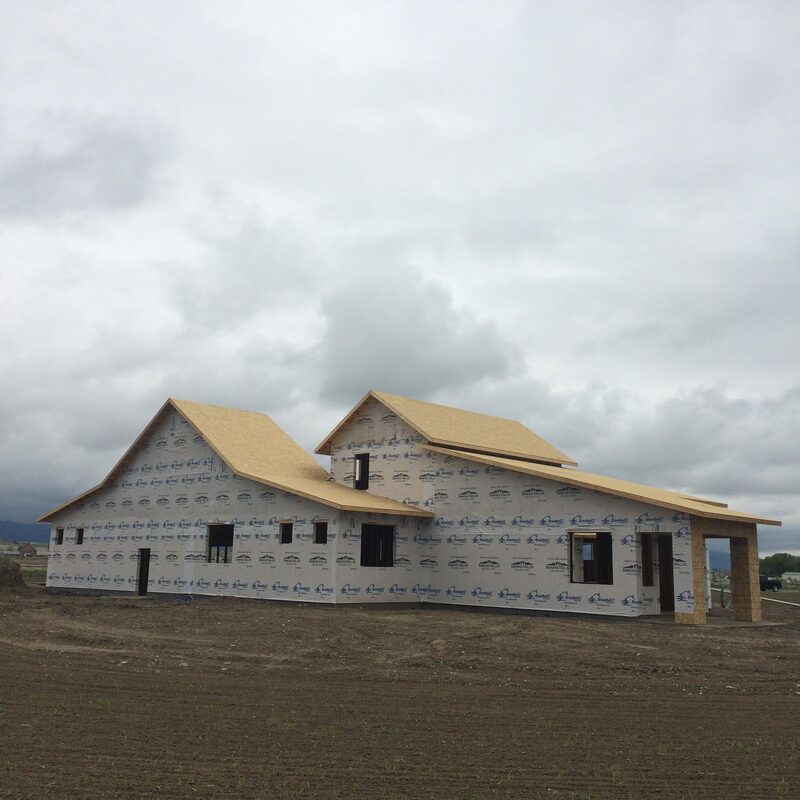 These large openings look west across 20 acres of farmland. Tyvek is a breathable weatherproofing that is wrapped around the entire facade. The front entry has a dynamic change in elevation. This creates interest on the exterior and unique design opportunities inside. The sheet rock installation is complete. 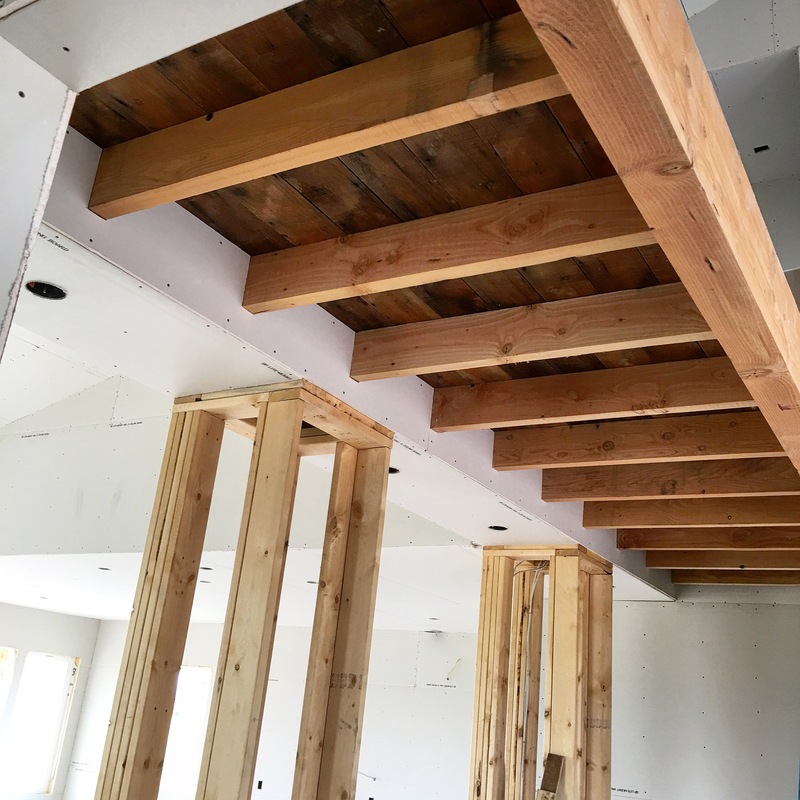 The white walls are giving us a better look at this real wood bridge installed during the framing. The wood floors are installed. They will be protected until the final unveiling. 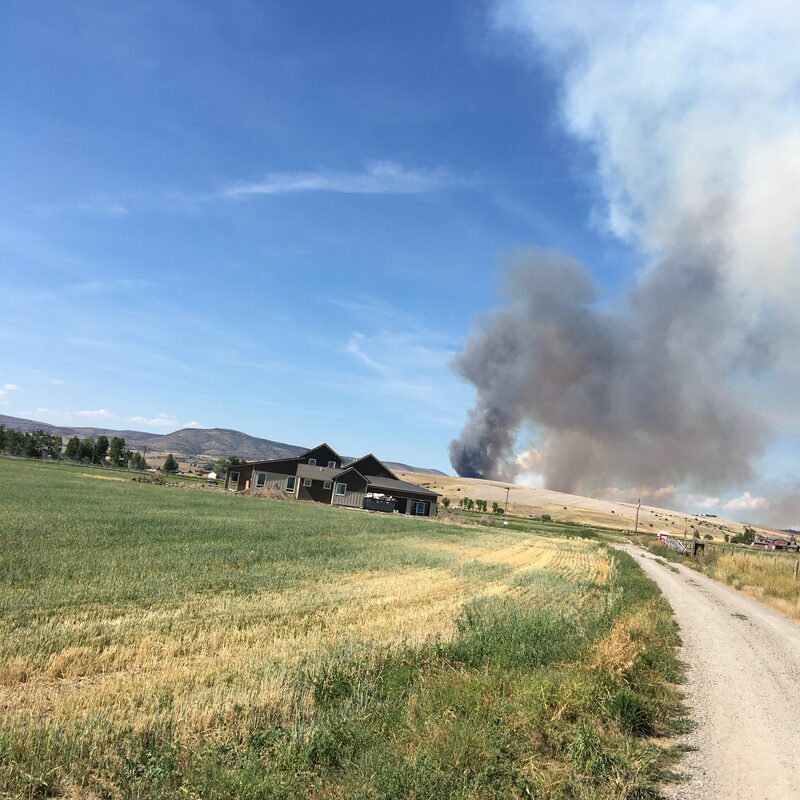 A nearby field caught on fire today. The smoke plume was a little close for comfort. The final material palette is complete. 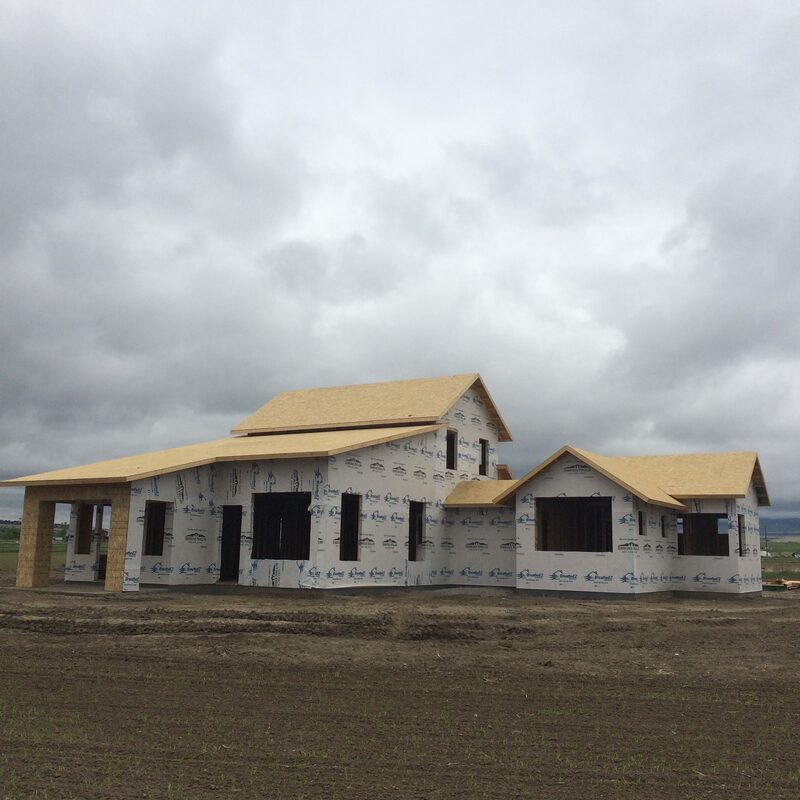 It includes a two toned horizontal siding, almond board & batt, weathered wood shingles and metal roof. The bridge is the designated center of the home. It separates the Master Wing from the Kid's Wing and primarily where all guests are greeted. 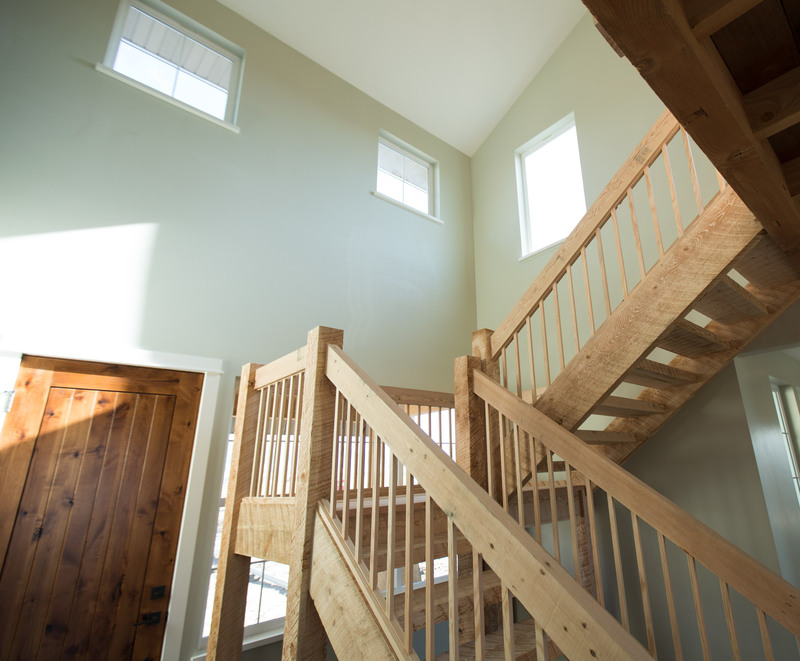 This free-standing staircase sits in front of a large window. 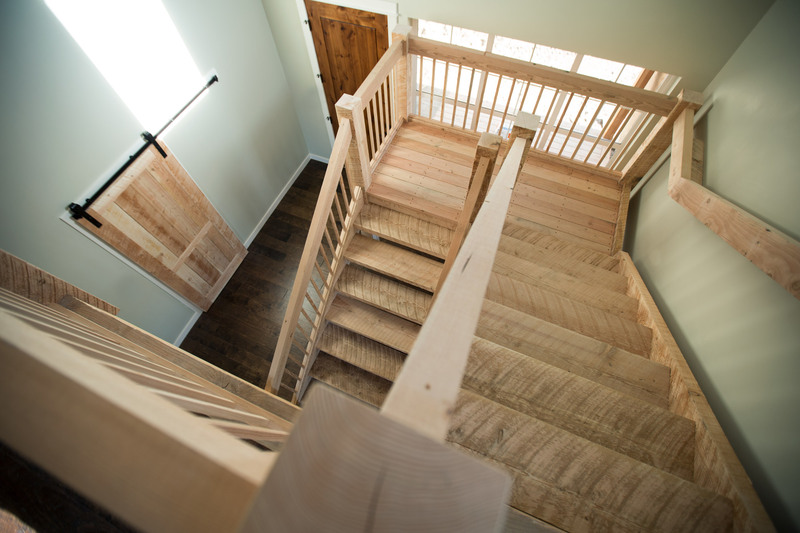 The treads and railing are kept open in order to allow maximum natural light gain. The front door is centered across the main entry and Great Room. 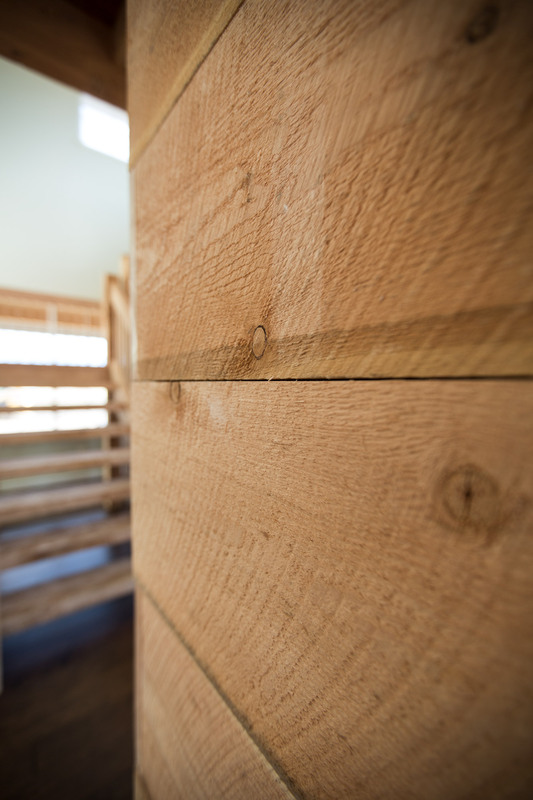 Design elements like these tie rooms together. 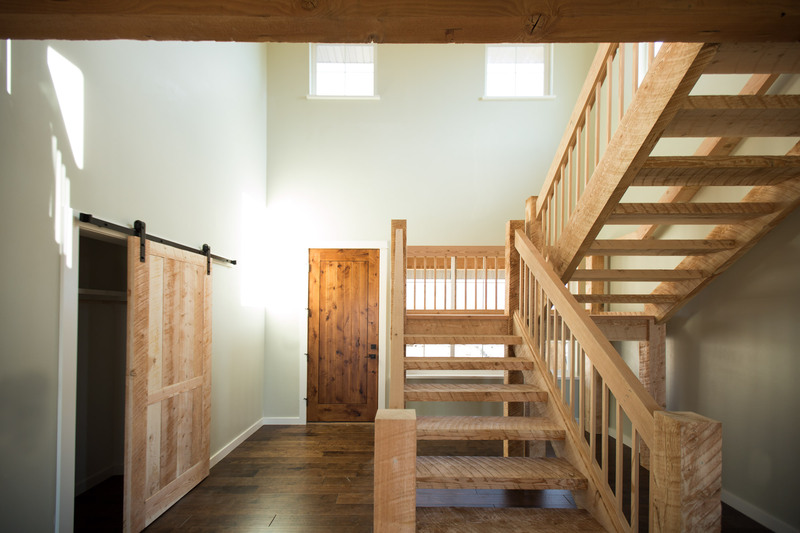 This custom barn door was crafted by the homeowner. 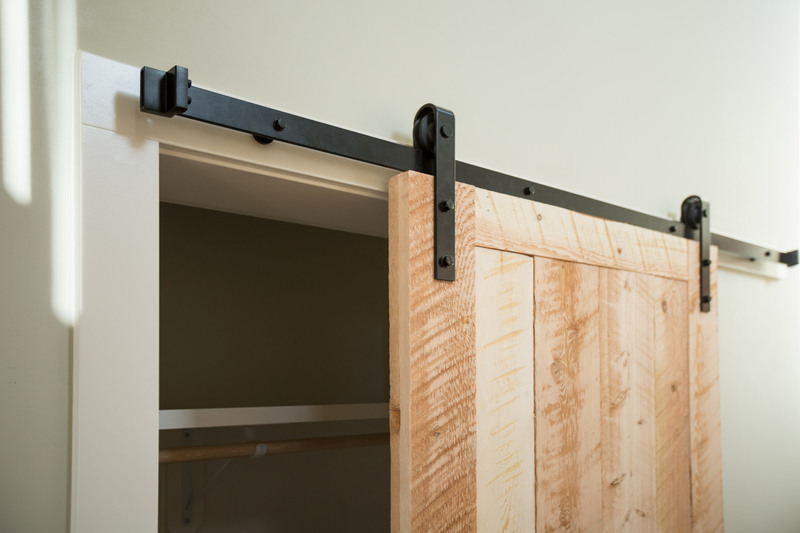 It hangs from oil-rubbed bronze hardware and covers the main entry closet. Two steps lead down into the Great Room and Kitchen. 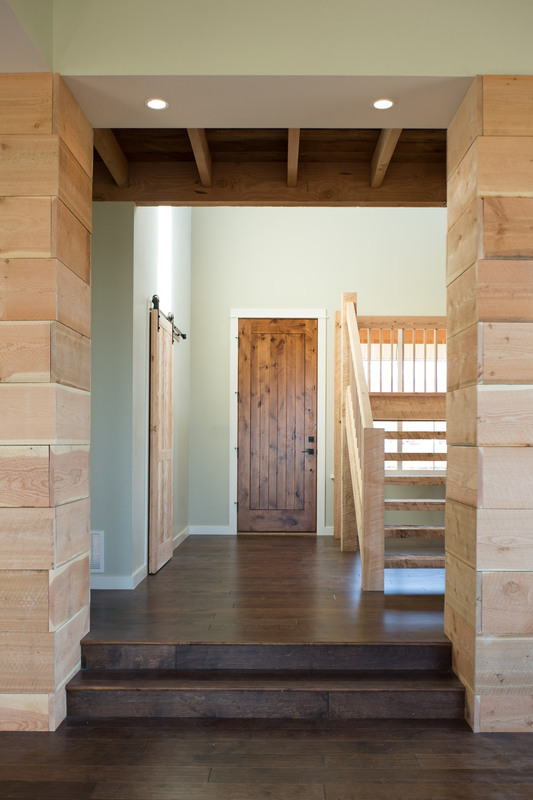 It is a grand entrance to an open room with large window openings and lots of height. The main entrance is two stories tall. 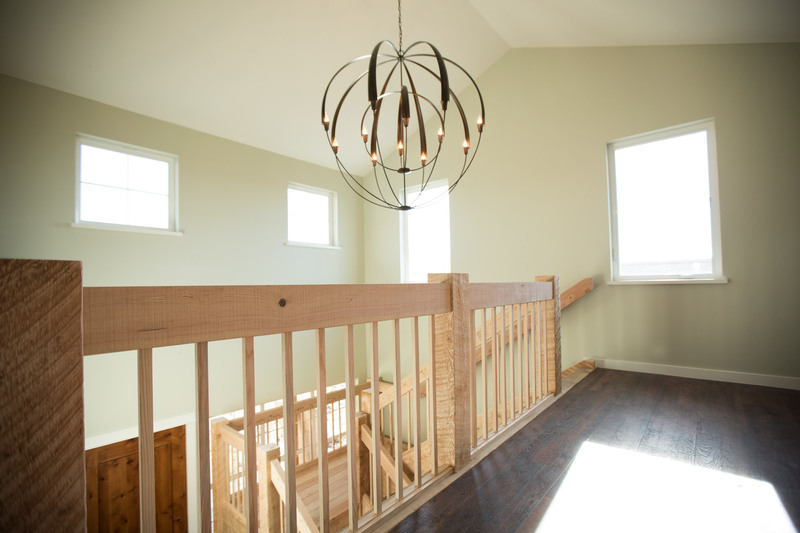 It includes a custom timber staircase that leads to a bridge and winds around a large chandelier. Celestial windows allow light to wash spaces of extreme height. These windows project the eastern and southern sun. 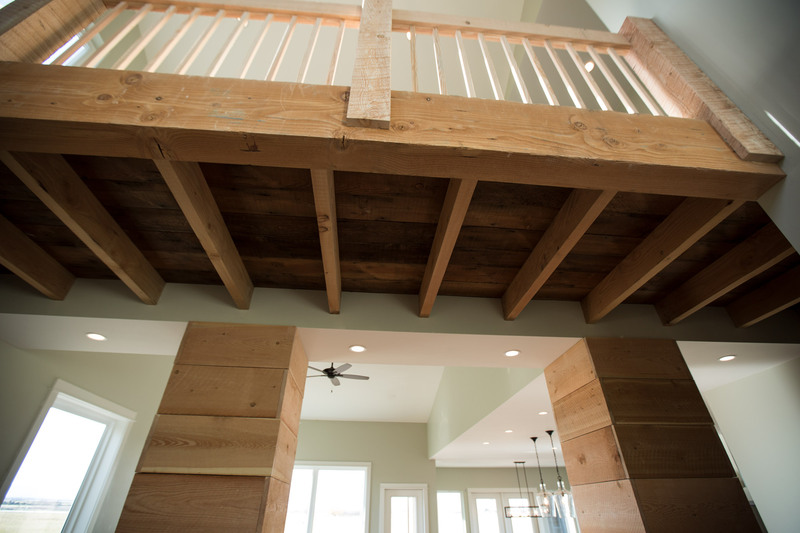 These timber beams are structural. 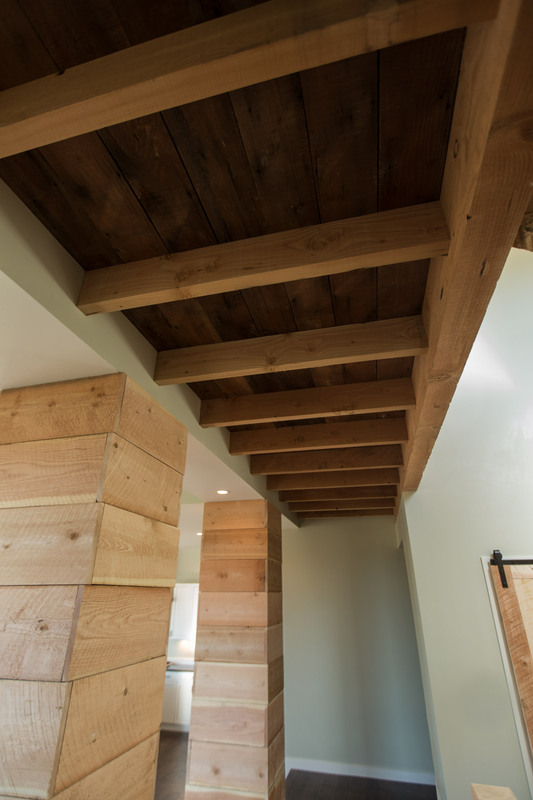 They have been decked with reclaimed planks from an old warehouse in Oregon. The Bridge is held up by two thickened columns. 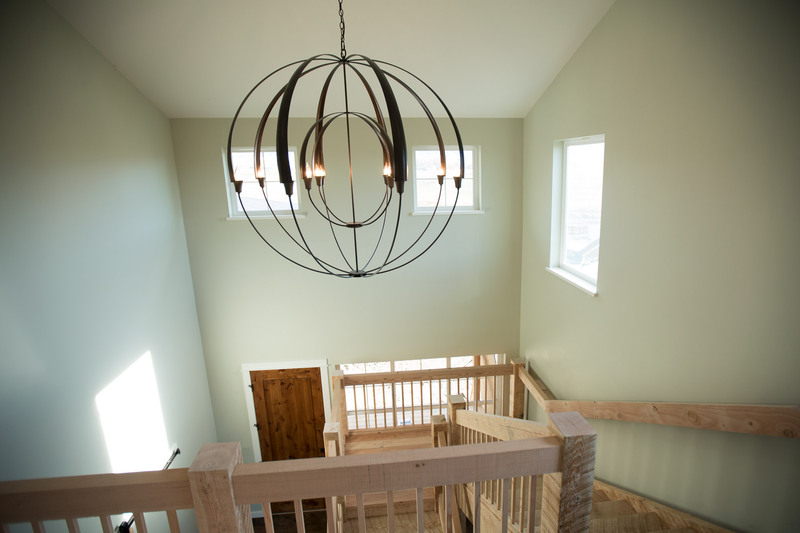 Above, the railing detail connects to a structural beam set during framing construction. Once atop the bridge the perspective of the main entry changes entirely. 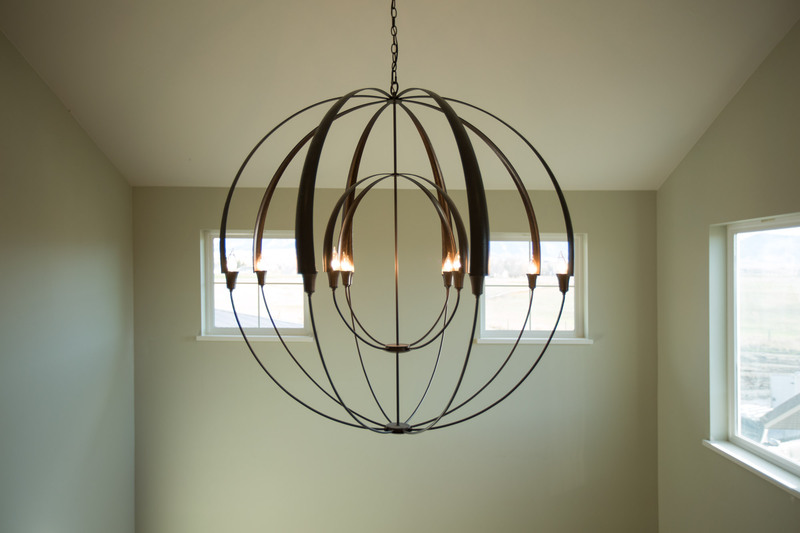 This chandelier is 6' in diameter and hangs nearly 15' in the air. 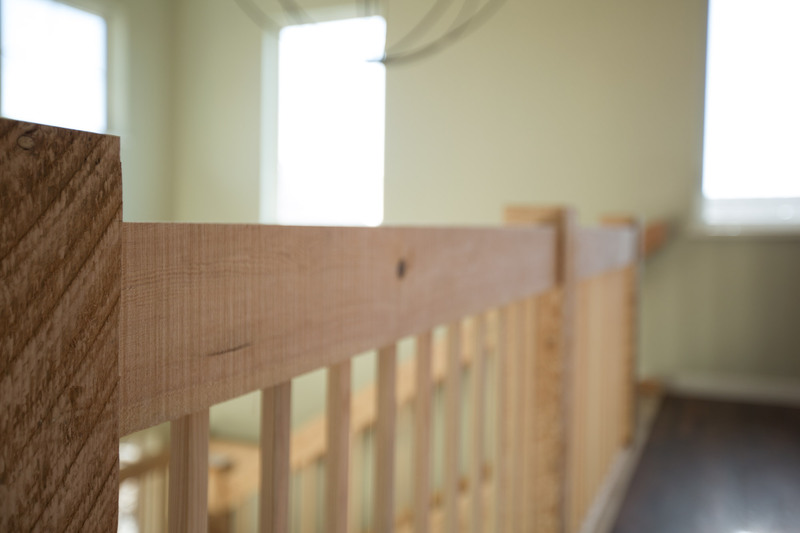 The spindles of this railing have been dado'd into the railing and caped to hide conceal fasteners. This is one of the most comfortable spaces in the entire house. The open treads have been carefully connected to the stringers with a mortise and tenon joint. 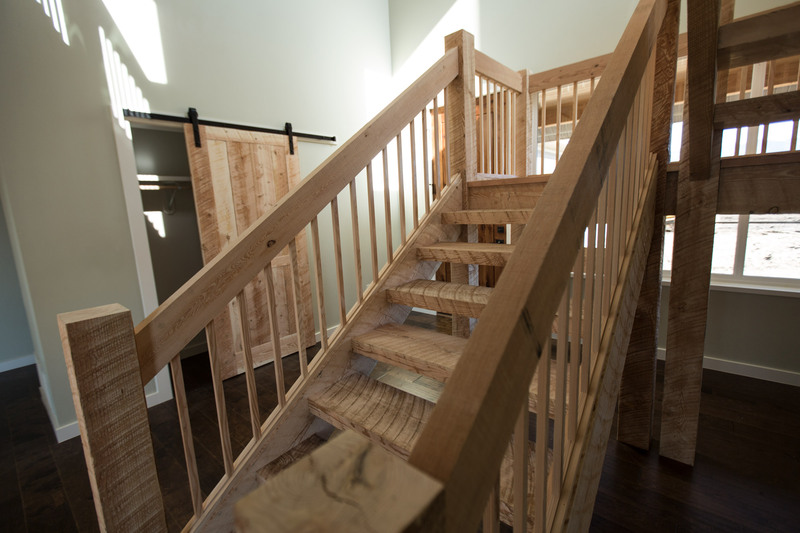 The timber staircase sets atop the timber bridge. A home should inspire daily. The owner's of the Dry Creek Ranch are greeted by this view every morning on their way to the coffee pot. 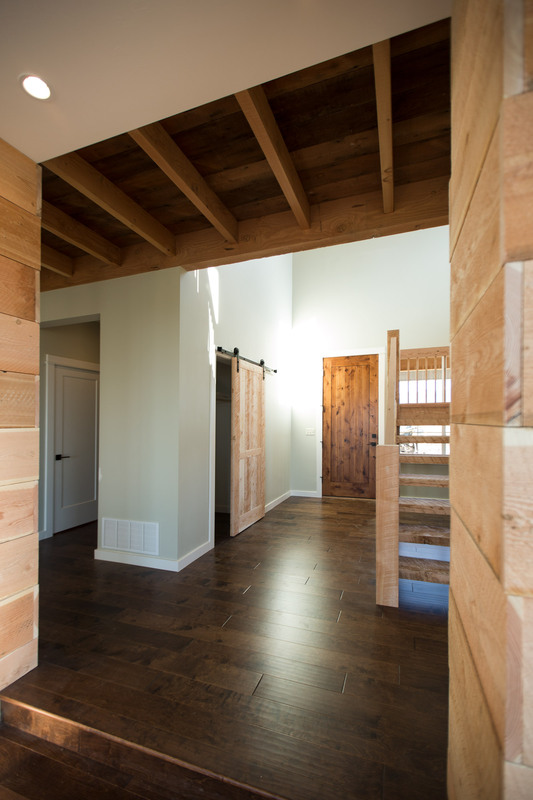 This hallway divides the Master Suite from other gathering areas in the house. 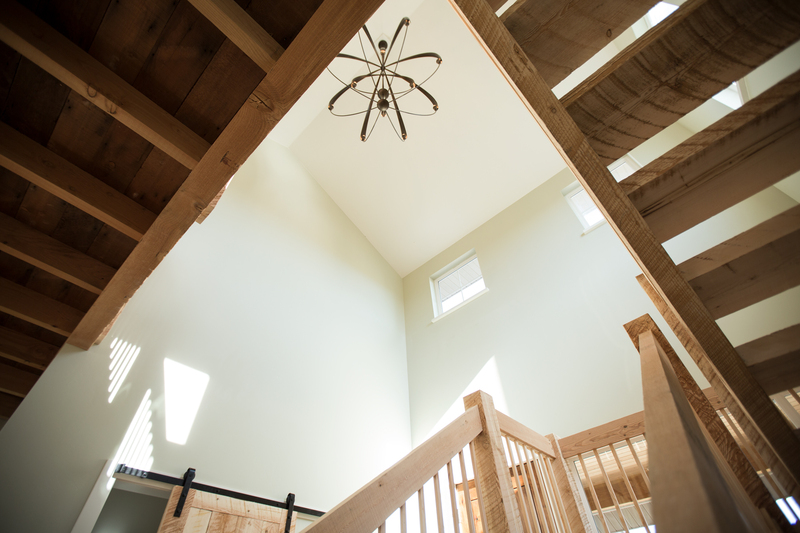 It is full of natural light and beautiful views both inside-and-out. 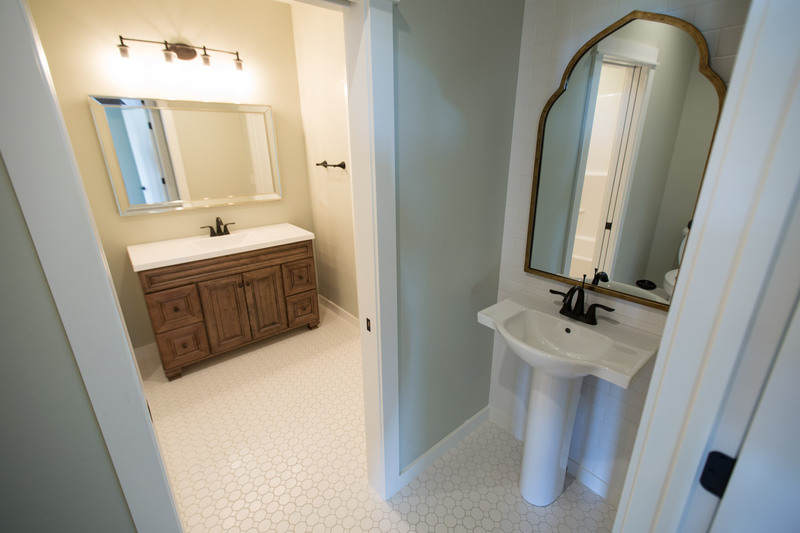 The vanities in this bathroom are free standing furniture pieces. They've been centered on a 3' x 5' custom mirror with lighting on either side. 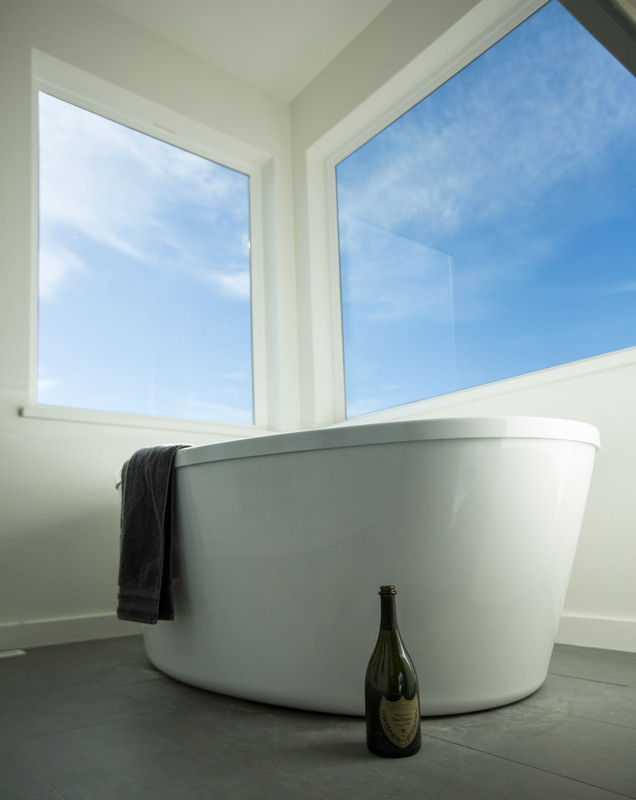 This free-standing tub sits in front of two large corner windows. The sunset view from a warm bath is incredible. 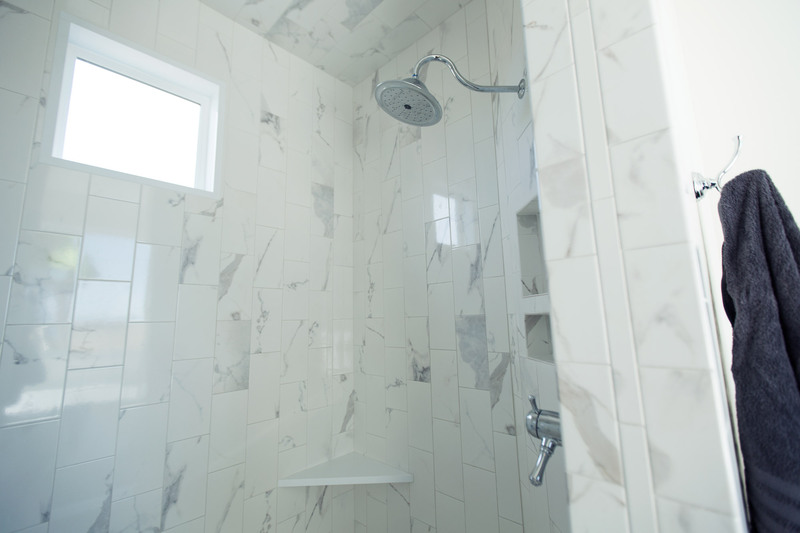 The master shower has a his and her side, comfortable corner seating, natural light, soap niches and two rain shower heads. 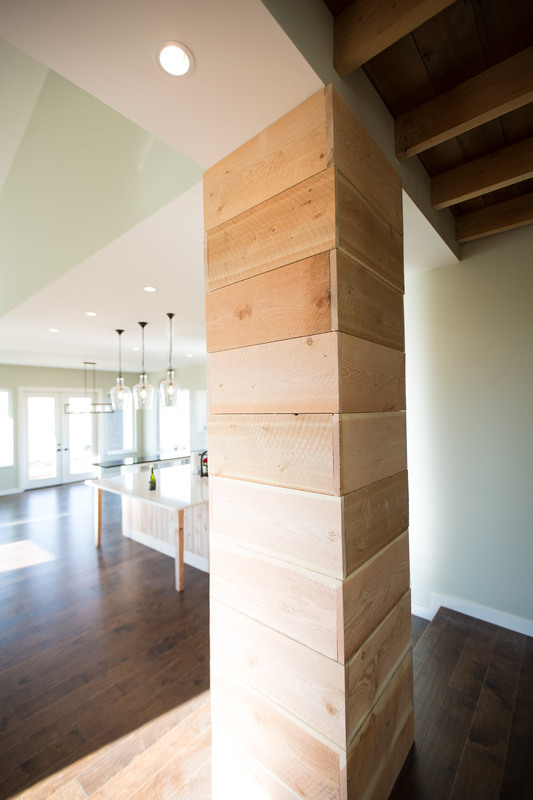 These wood pillars are 2' x 2' wide. 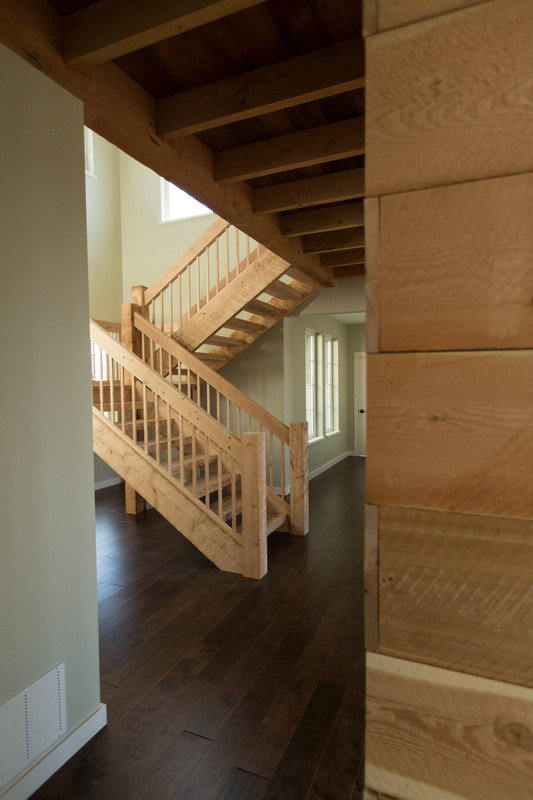 These timbers are a real-wood product that has been milled with a circular saw. 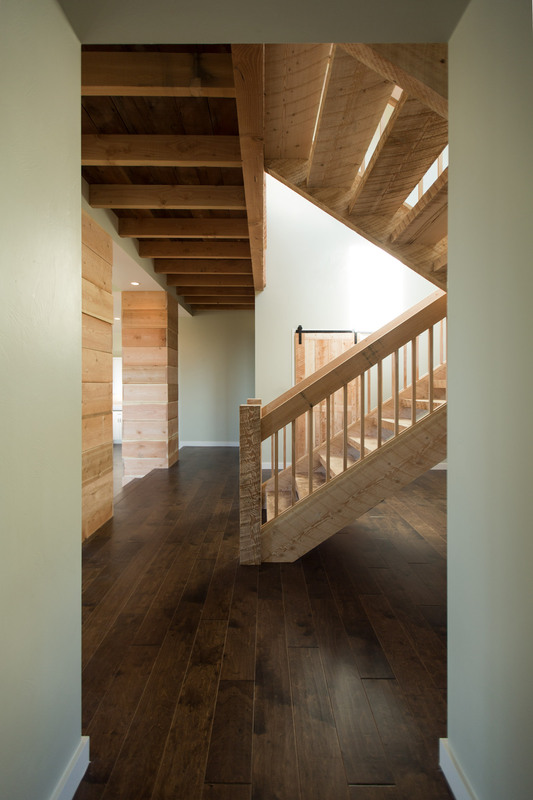 The rustic quality of each timber adds character and interest. 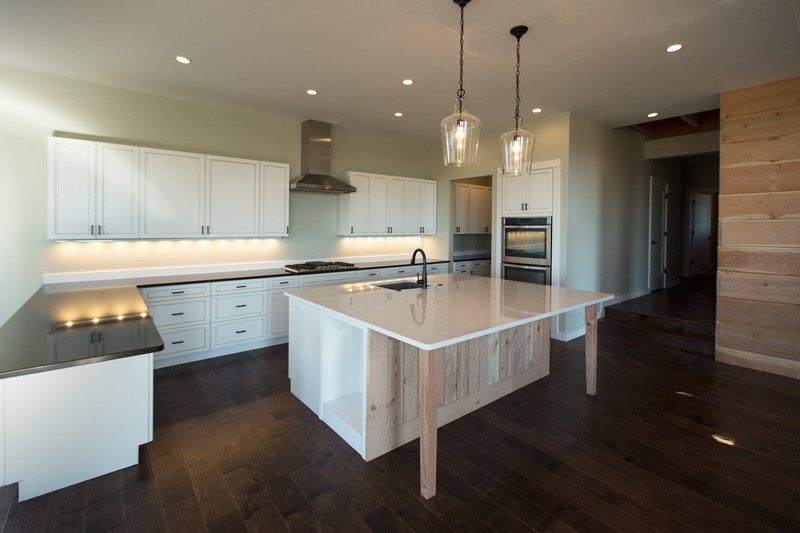 Quartz is a harder surface than granite and non-porous. Which means that you don't have to worry about spilling wine on a white surface. 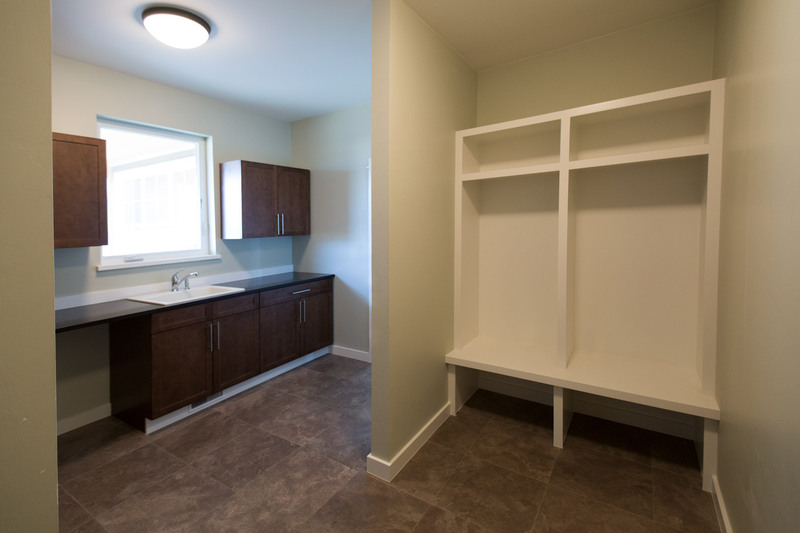 The Mudroom comes standard with lockers for gear, a utility sink with a view and plenty of storage. 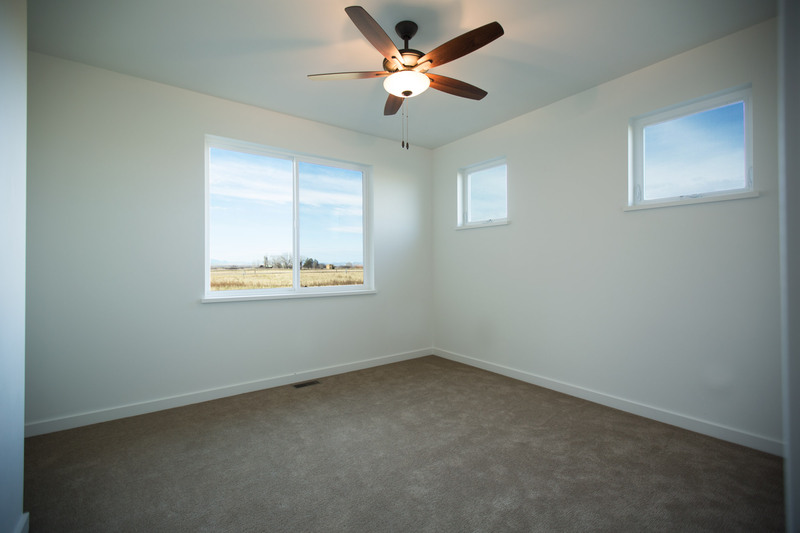 This room is spacious. It has a large closet, study nook and incredible views of 20 acres. 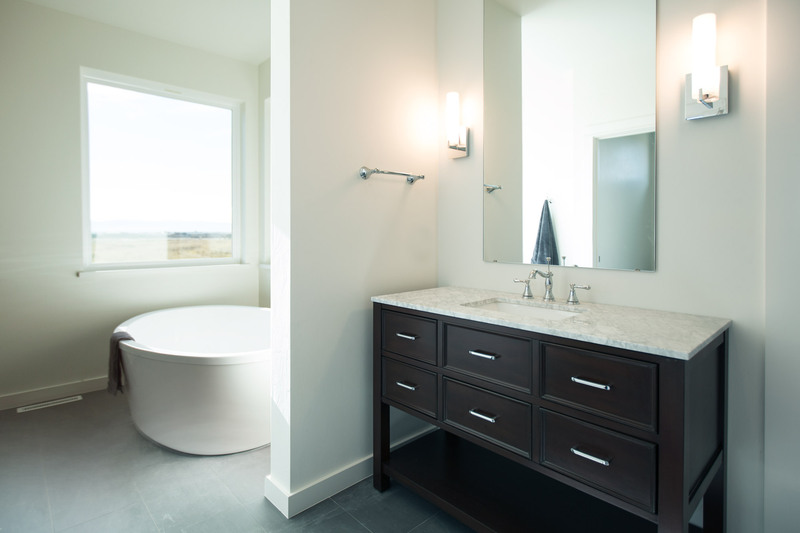 The powder bath is connected to the shared bath for ease-of-use. 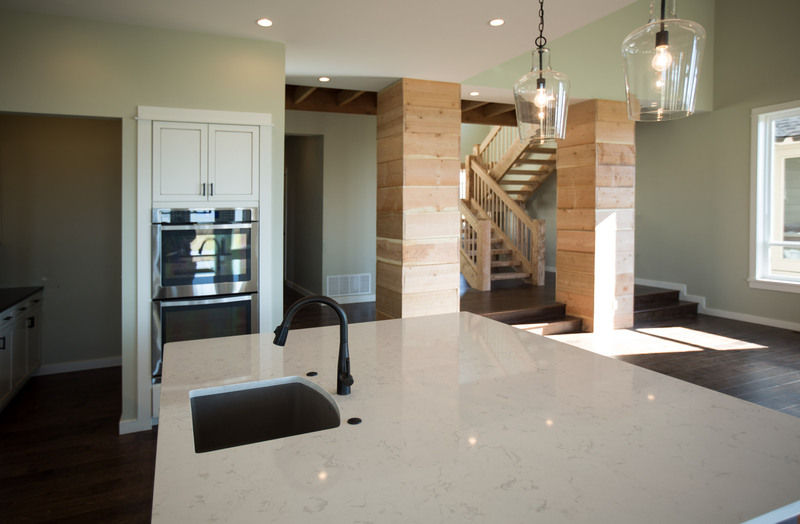 Notice the open storage at the Kitchen Island. Future cook books will be stored here for easy access. The dining room is large enough to seat 10 people. A wall of china cabinets separates diners from the kitchen while still maintaining an open feel. 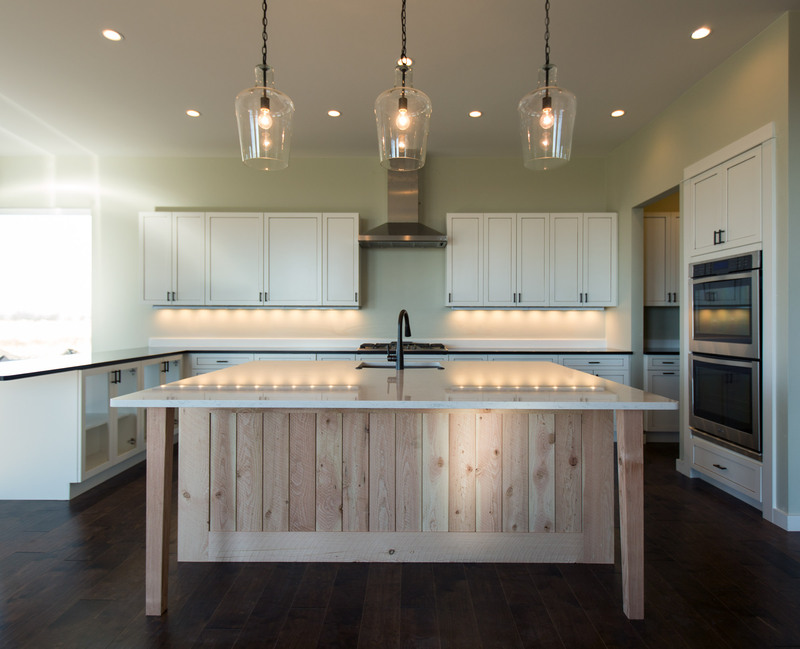 The kitchen island includes a sink, dishwasher, open storage and beautiful real-wood accents. There is room for 5 or 6 guests to sit comfortably. 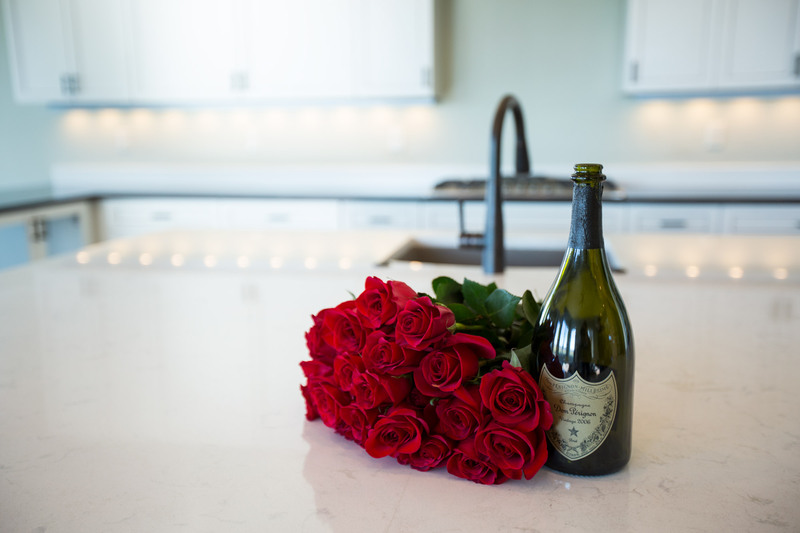 Roses and Dom Perignon go nicely with keys to your new home.